I've recently been working on a project which focuses on the CBS sitcom, The Big Bang Theory. My "research" involved (I doubt there will ever be a point where I don't feel ridiculous calling watching movies and TV "research") having to binge watch all 10 seasons of the series. I'd watched the first 6 seasons once already, but this was my first viewing of seasons 7-10. And, for the most part, I enjoyed them. However, I found myself slightly troubled by what I perceived as bad directions taken with some of the characters I loved. On the IMDb website, there's a run-of-the-mill "Main" Message Boards area that covers a large range of topics pertaining to movies, TV shows, celebrities, trivia, awards, and plenty of subtopics within each of these groups (over 140, according to Wikipedia). But the websites best feature is the message boards it has at the bottom of each page for every individual movie, TV show, video game, actor, director, writer, producer, etc., in the business (according to common sense, there's thousands of those). To see this all go way is a truly sad event. 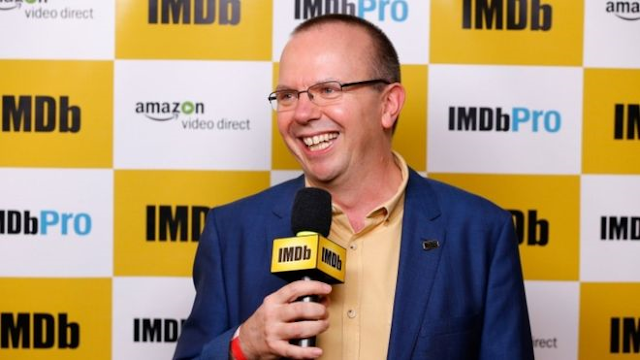 I'm not one to make claims that I can't support with evidence, but I do have a sneaking suspicion that this writer and most others writing in support of the news of IMDb's decision aren't actually users of the boards in question. And, instead, are merely taking IMDb's word for it (or implication for it, at least) when they support the claim that the website is a cesspool of racism, evil, immaturity, and offensive behavior. Nevertheless, if you were to head over to IMDb's social media accounts right now (Twitter, Facebook, YouTube, etc.) — which they claim to be a preferred environment for fans to discuss movies and TV — you'll find that the only discussions currently going on are an overflow of upset and/or angry comments from users who are seriously distraught about their beloved boards going away. 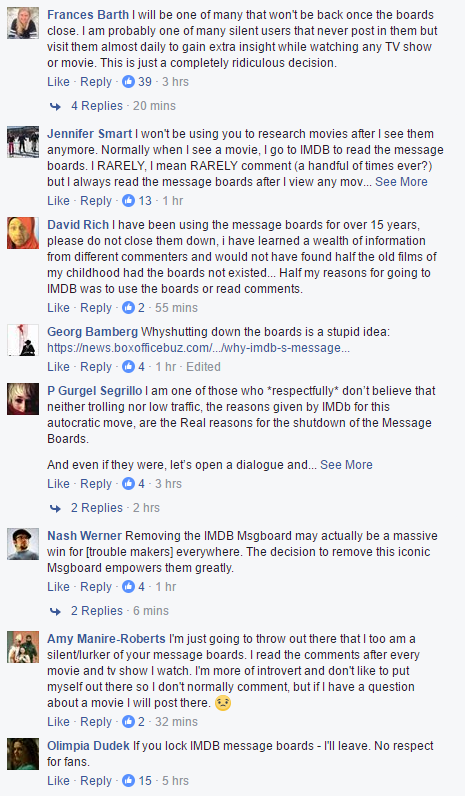 It all begs the question: How honest is IMDb actually being when they claim that the decision was based on the interest of the readers? If we go by IMDb users own comments, it looks as though very few are in support of the change. One of which, as you've undoubtedly gathered, is myself. Personally, I've been using the IMDb message boards for 13 years on a regular basis. More often than not, I'm only reading the comments of others for films and TV shows I like (and plenty that I don't like). But when I feel like I can add to the discussion I'll not hesitate to jump in there. In fact, many of those discussions are ones that I eventually translated into articles that I've written for various other websites. Which, granted, judging by my readership may actually be a mark for IMDb's decision. But never mind that. The point is that there's plenty of on-topic discussions going on there. After reading several articles about the news and scrolling through the comments from users, the ones rooting for this change appear to mostly be focusing on how "full of internet trolls" the website is and how immature it's become. But it's almost always been a pleasant experience for me, personally, when I've gone there. Whenever I do come across silly threads, I usually just scroll right past them and, with no effort at all, find a reasonable discussion on something interesting. This is no different than what I do with every other popular board or comments section on the internet. And I get the feeling that this abundance of trolls probably is only in reference to those more popular movie and TV show boards, and the actual Main Boards area of the website, which I admittedly rarely visited. However, even if we are to assume that the most popular and active boards were running over with internet trolls, it's still the case that the vast majority of message boards on IMDb most certainly aren't. It has to be remembered that there are stand-alone forums found under every individual film, TV show, actor, or crew member imaginable on the website. They are very calm, mature, and respectful places. It's only the popular areas (forums for big hit movies and television shows and, of course, the always active Main Boards) that you're likely to find people acting a fool. But isn't that to be expected? Just like how a concert or a peaceful march is more prone to turn ugly when the crowds are too large, a forum or comments section is bound to do the same if its numbers are high; it's been that way for as long as I can recall. It's the nature of the interwebs. I go through and look at all of my past discussions and they've always been real, on topic conversations with no more problems than the occasional heated nerd-debate about stuff like whether or not my theory makes sense or whether you agree with me that the ending of True Blood and LOST were lame (they were... a lot). I mean, this is the same sort of stuff as with YouTube (only YouTube seems worse with the immaturity) where if you're on a popular video, you're more apt to run into douche bags simply because there's more people around to up the odds. Whereas, if you're watching something relatively obscure, forgotten, or not currently trending you can easily have a fun discussion without an issue. Which I did all the time. And even when I didn't involve myself, I could still always find insightful conversations between strangers that I could read and be interested in. I really can't remember any instance of going on IMDb (and I go there after almost ever film I watch and enjoy) and not finding something interesting on the boards. Honestly, I can't even think of a reason to use IMDb without them. So what if trolls do tend to gather on IMDb? While I didn't ever personally see trolls that were so problematic as to get in my way of enjoying IMDb's message boards, what if I had? Hypothetically, what if I had gone to the board of some very popular new movie and wanted to post an on-topic discussion, only to have it bombarded by trolls or have my thread lost in the rotation due to some jerk that's repeatedly making nonsense threads? For myself, if it were that bad I could either: A.) Leave that board, B.) Block this person so that I no longer even saw their posts, or C.) Just ignored them and speak only to those who want to have a serious discussion. If trolls were so much of an issue, why couldn't I just make the choice to not involve myself with the places in which they congregate? Like I've said, however, there never was an instance that I can recall that things became that bad on IMDb. And it wasn't due to me actively avoiding these people (I didn't) and it isn't because I only focused my attention on the forums old, obscure or little-known films and TV shows (I didn't do that either). 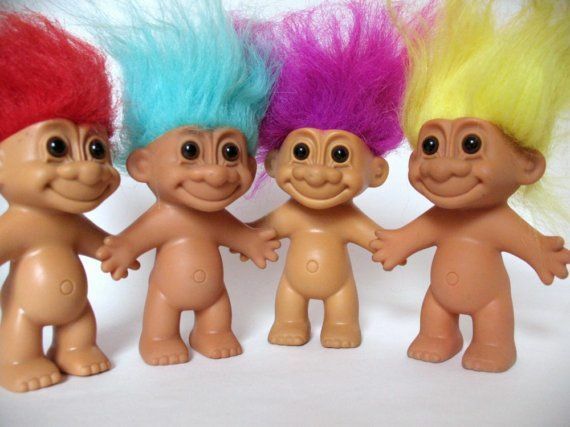 While trolls will always make their presence known at the populated discussion boards of popular and trending media, these places are the rarity when it comes to a website that has forums for every media imaginable. But because there's troublemakers flooding into a densely packed Star Wars board, we're all to be punished? If you don't enjoy the boards with trolls, then couldn't you just, you know... not go on them?